Well during the July Scooter HQ run, RatRide faltered and died about 10 kms from the end of the ride. I had a feeling it was gasket related as there was no clanking or bad noise when cranking. And it was cranking over way too quickly and my guess was no compression. Well, it turns out I did indeed fluke the answer and I have a blown exhaust gasket. You can see here I have managed to sneak the seat bucket out from under the tail piece. This saves you about 25 minutes disassembling time . First of all you will need to remove the panel from the front of the seat and the two side panels. I will have to do up a blog post on how to do that. First remove the big bolt from the centre of the panel at the front of the seat. The front panel has tabs into the side panels. Push on the front panel in various places where it joins to the side panels. Eventually you will undo the tabs and the front panel will pull towards the front of the scooter. The two yellow circles are 10mm nuts you will need to take off. 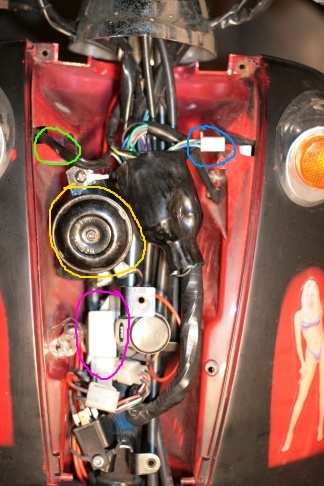 The red circles are two screws you will need to undo. 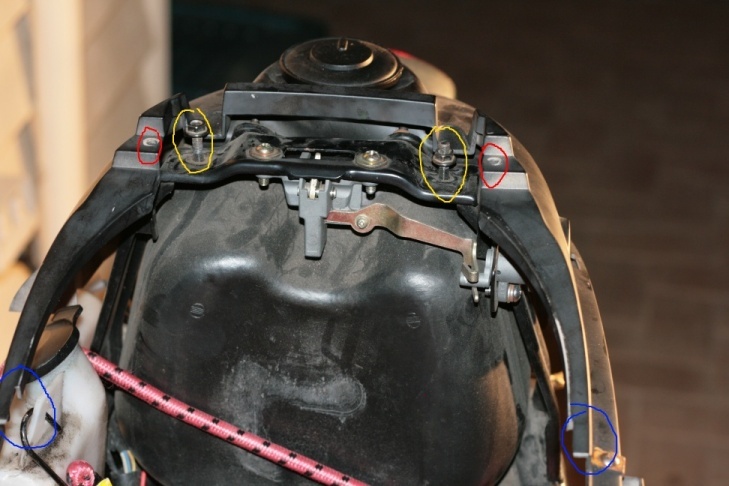 The two blue circles are tabs on the tail piece which fit under the bucket. You need to slip those tabs out from under the bucket. You also need to remove the fuel cap to lever the tail piece whilst trying to lift the rear of the seat bucket over the two bolts that you removed the 10mm nuts from earlier. Be VERY careful here. I am guessing it is fairly easy to force the issue and do damage to your tail-piece. 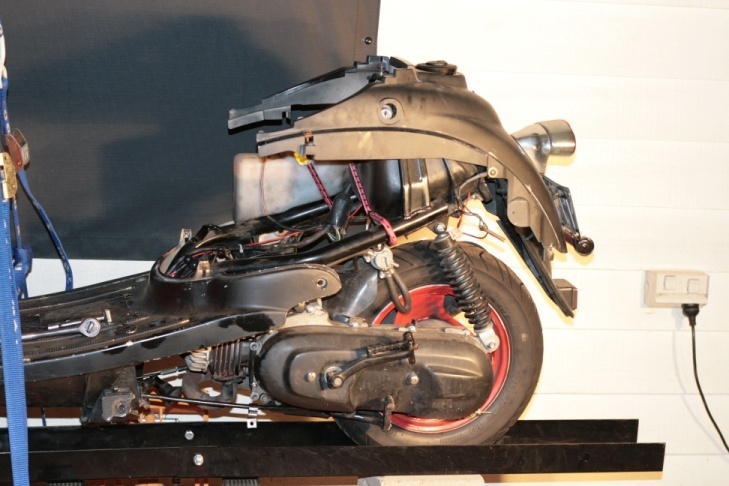 So you can see a front-on view with the seat bucket removed. You will note the funky red with black accent (seems to be a common theme for RatRide) bungee chord holding the oil tank on. You DO NOT want that oil container to fall off the scooter. It is very messy. And now for a lesson in what a blown gasket looks like. 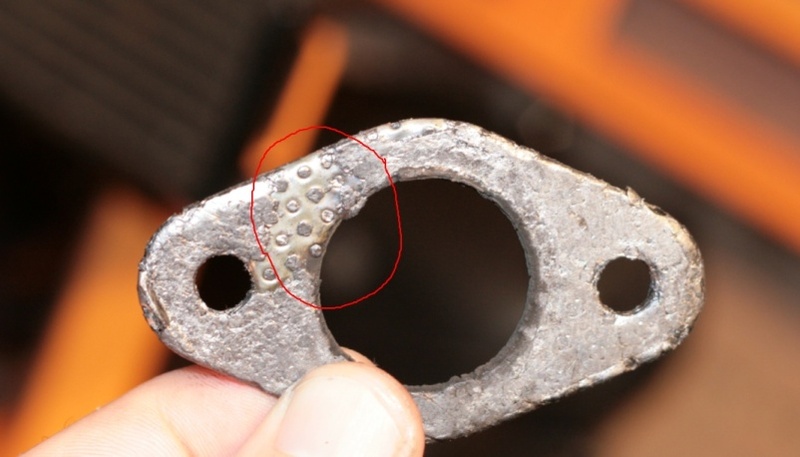 A new gasket has heaps of grey mushy stuff on it as can be seen in most of the gasket. 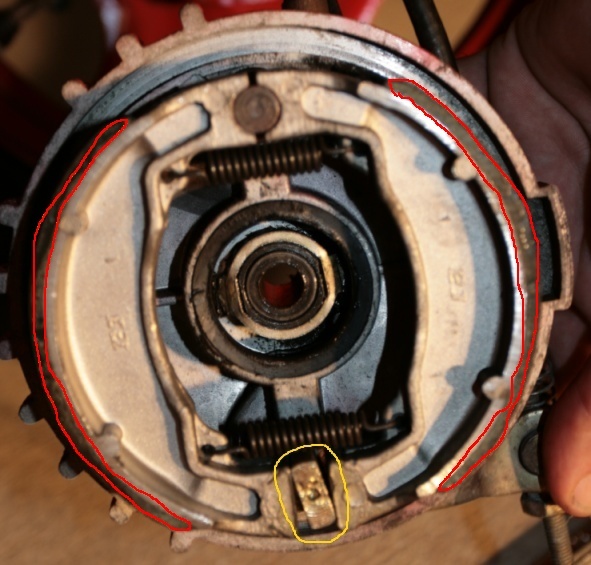 Inside the red circle you can see where the grey part has gone and there is only the hard metal-type part of the gasket. The metal part is fairly bad at providing a good seal especially on the exhaust side which is under more pressure than the inlet side. Well, as a further update, I pulled the head off and the original problem I had with gudgeon pin clips letting go and busting up the top end has happened again. My 2003 Milan was the last with the 10mm gudgeon pin. The year after they upgraded to 12mm which is a stronger design. After talking to my scooter shop, apparently some of the 10mm Milan engines had a tendency to let go. So they are looking up a price for a reconditioned Milan engine with 12mm pin. Hopefully that will give me a bit more reliability. I don't mind my scooter looking like crap, but I want the engine to be reliable. So stay tuned for a engine replacement blog post. Removal of the front panel. This allows access to the headlight bulb, horn, regulator and some other stuff you don't want to touch. Screws on the back of the panel. 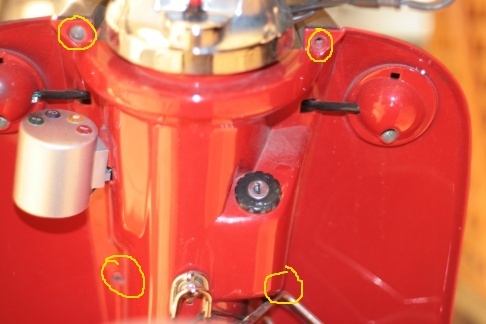 There are also at least 3 screws on the back of the front panel underneath the handlebars. 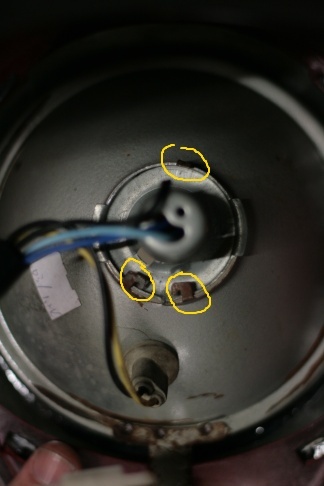 You can see the screws circled in yellow. I think my scoot was missing some of the screws and I am now down to one screw on the upper left. Will have to look at replacing the screws.. 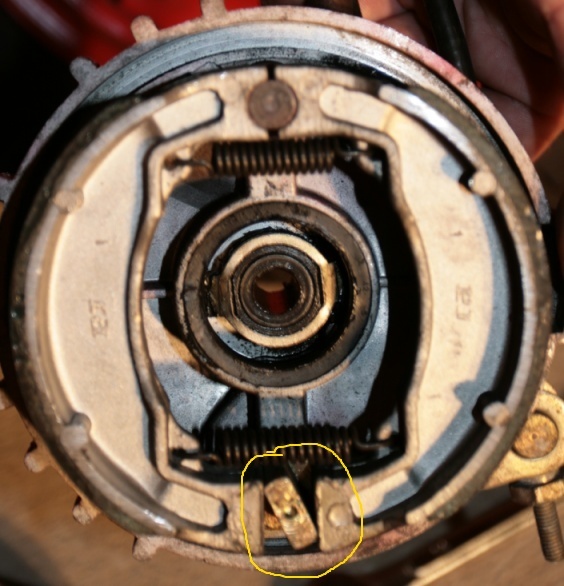 Step 1: On the front of the scooter there is a main bolt. Note that there is a bolt going into a spring. This is for adjusting your headlight. Don't touch this one. It is the bigger bolt underneath. Shown in the picture below circled in yellow. Once you get this bolt out, the panel will fall forward slightly. Panel lower tabs: I actually broke the left hand lower tab when I first removed the front panel. The panel still seems to have stayed on so I guess no critical damage. I really don't have a good tip on removing this. Wiggle the panel VERY gently around pushing down slightly and eventually the tab will pop out of the plastic holder. 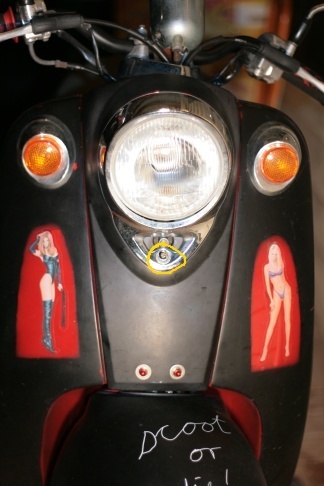 Headlight view: On the back of the front panel you get access to the bulb. You can see two of the tabs in the folded down position on the bottom of the bulb holder. You can just see the upper tab which I have folded up to remove the bulb holder. I wonder how many times the Chinese metal will cope being folded up and back down again. You should be able to manage to straighten the top one and wiggle the bulb holder out without having to straighten the two lower tabs. Behind the Panel: Behind the panel you can see lots of wires and stuff. I have circled some pertinent bits. Green circle - Wires running out to indicator. Same for left-hand side indicators. Yellow Circle - horn. Teeny weeny horn with which to protect your life from 4wd-controlling crazies. Re-installation of the panel is the reverse of removal. I find it goes back a lot easier if you put the rear screws in first. This pulls the panel into position for the main bolt on the front of the panel. The main bolt is a bit of a pain until you get used to putting it in. 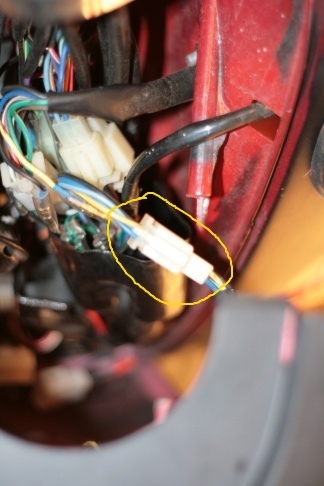 Remember to plug the headlight wire back in, otherwise you will get some more practice in removing and re-installing the panel. 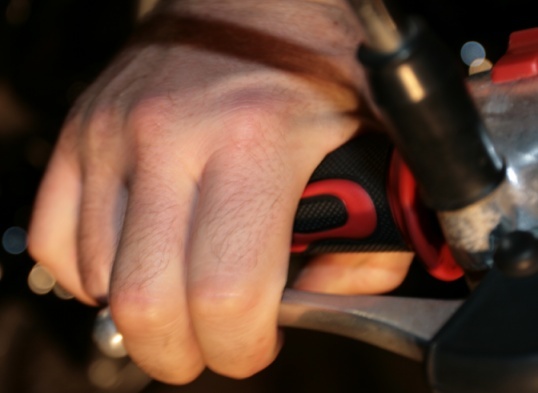 You will notice over time your brake efficiency will start to decrease. The same amount of brake lever travel (how much you squeeze the lever) will result in the scooter not stopping as quickly. We can see in the next picture the lever has travelled a long way towards the flame grips (if your scooter did not come with flame grips, please consult your dealer ) before any actual braking has occurred. This results in your scooter taking longer to stop, and more dangerous scooting... This means your brakes need adjusting back to normal operation. As a brief explanation as to why this occurs I will give a very quick outline of drum brakes. Basically you have a round cylinder which your braking system sits inside. This is called the drum. You have two round metal pieces which have the braking material attached to them called the shoes. 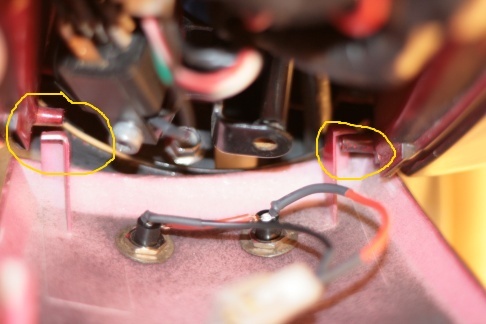 In the yellow circled area you will notice the almost vertical bar which I will call the actuator (couldn't find proper term) which when at rest is almost touching the shoes. This will be important later on. When you squeeze the lever, the shoes are forced outwards towards the drum. You will notice the actuator is a lot less vertical this time and putting outward pressure on the shoes. The braking material contacts and places friction on the drum and slows the scooter down. Over time, the braking material is ground off and worn down. This results in there being a greater space between the shoe and drum, resulting in less braking occurring. Now we must adjust the brake shoes to be closer to the drums to compensate for braking material wear. To do this, we cause the shoe actuator (flat metal bar doodad) to be less vertical at rest which pushes the shoes out more at rest, thus decreasing the distance the shoes must travel to contact the drum when we squeeze the lever. If you look at the front wheel, you will see the following assembly coming off the axle. This is the adjusting assembly for the brakes. The rear brakes have a very similar adjusting assembly. You will notice the hump in the adjuster I have highlighted with yellow. When you adjust the brakes you are rotating this adjuster between the humps. So it will not be a smooth rotation like a normal nut. It will rise and fall in time with the humps in the adjusting nut. At the moment because the dip is showing, I am half-way through one adjustment. The "dip" will sit vertically and you will feel the adjuster fall off the "hill" and easily rotate around to sit on the dip. 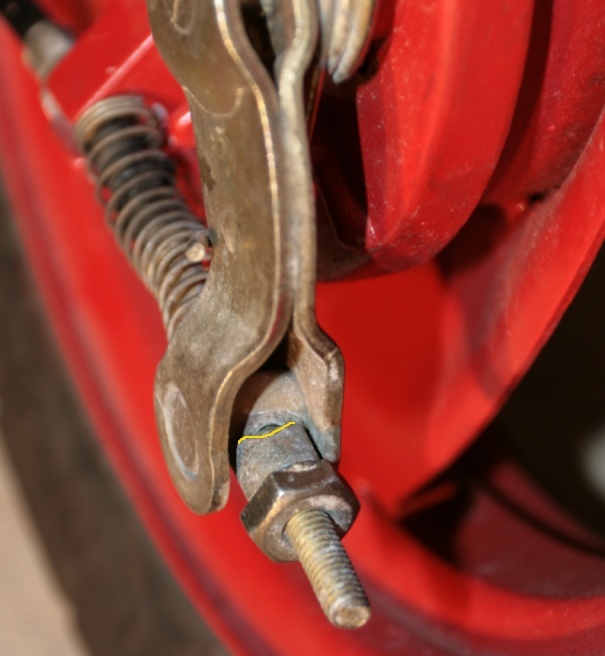 On the 2003 Milan, you will require a 14 mm spanner. When you are adjusting the nut you will want to rotate the nut clock-wise as if you were looking at it from the rear of the scooter (basically from the ground up). This will force the braking assembly to cause the actuator to be less vertical in the rest position, and hence push the shoes out a little further. Now here comes the personal feely bit. I like my brakes to be almost on straight away and the lever to start operating the brakes almost straight away. Less lever travel results in braking happening at an earlier stage, means slowing down quicker. 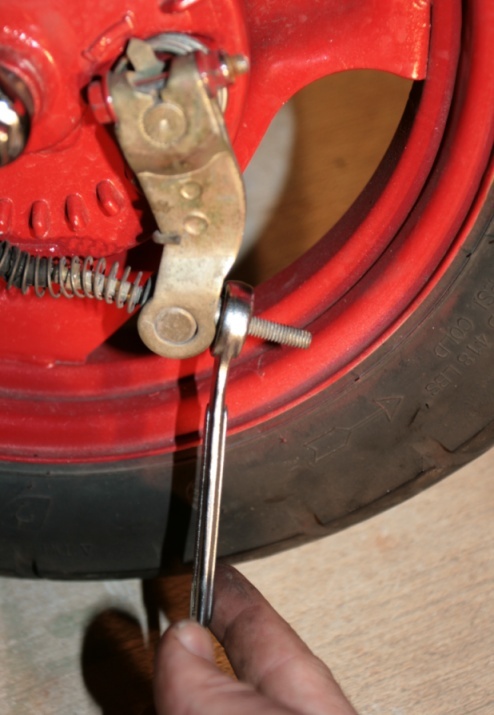 It is a matter of adjusting the nut one bump, spin the wheel (you will need to sit the scooter body up on something to hold the front wheel off the ground or if you are strong enough, lift the scooter by the axle nut), and pump the brake. This helps settle the actuator and shoes in the new position. You will want to spin the wheel again to make sure the wheel is not binding. The front wheel should rotate easily, perhaps almost 3 revolutions. 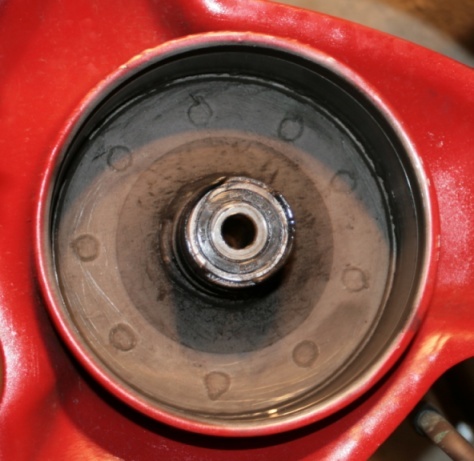 If you turn the adjusting nut too many times, the wheel will come to a stop almost straight away. This means the shoes are touching the drum all the time and you will be grinding off braking material as you are riding. You will wear out your shoes faster, which is costly and perhaps put a bit of extra strain on the engine and clutch so you want to get the adjustment correct. The rear wheel adjusts in exactly the same way as the front wheel. It is already off the ground thanks to the centre stand. One thing to note about the the rear wheel is that is also driving the rear gears at the same time, so it does not rotate as freely as the front wheel. It should spin about 1 rotations or so. Adjust the nut one bump, spin the wheel and pump the brake. Then spin again. If the wheel rotates fairly freely and the lever position is comfortable and operating the brakes in a position you like, then you are done. If you have any reservations, please understand that braking is critical to safe scootering and pop into your local friendly scooter shop for a reminder course on brake adjusting. Alternatively ask a question in the comments section and I will endeavour to answer it. I was thinking about doing a video of the adjustment procedure as well. If people were interested in that, pop it in a comment. Checking your oil is one of the most important periodic maintenance checks you have to make, other than weekly tyre pressure checking, and pre-ride tyre surface checking. It is a fairly simple process on the Milan and I generally check the oil level monthly. All you need is a screw-driver and perhaps a torch or overhead light. I use Shell SX2 2-stroke oil as it was recommended to me by Scooter HQ. DO NOT USE 10W40 oil as recommended by the Chinglish Vmoto manual. There are some 4-stroke Milans sold overseas which use the 10W40 oil, but only 2 strokes are sold in Australia, and hence need 2 stroke motor oil. The inspection panel is located just under the seat on the right-hand side of the Milan. If your Milan did not come with flaming skull decals, please refer to your dealer. You will need to turn the screw with a flat-bladed screw driver until it sits in this angle. I actually worked out that you can just use your ignition key. The screw holding the panel on will be disengaged in this position, and you can pull the panel out with the little handle just to the left of the screw. There are two plastic tabs on the bottom and one tab on the left of this panel. Edit: It appears that some years of Milans have a wing-nut (butterfly nut) instead of the screw mine has. Whatever the case, simply keep turning the nut/screw and at some point you will feel no pressure on the screw/nut and you can wiggle it a little. This means it has disengaged from the plastic panel. I found it really hard to take a photo of the bottle displaying the oil level. My oil for this check was a fair way down. The oil is at a good level when it is just below the angled part of the tank (see the dodgy yellow line painted in) at the front of the bottle as you face the scooter. You want the oil at this level and NOT up to the neck of the bottle because unlike a car, the scooter has some angle when you travel around a corner. If the oil level is too high, then you may get oil leaking out of the top of the bottle and onto your scooter or worse, onto your rear tyre. Use a funnel to make it very easy to add the oil. You want to make sure the funnel is clean first to avoid contaminating your oil. You will want to hold the funnel up a bit so just the spout is inside the oil bottle on the scooter. This way you can see the oil level when pouring the oil in. Remember that the funnel will continue to drip a small amount of oil when you finish pouring. Allow for this when adding your oil. Here is about where you want the oil level. The consumption of oil is fairly slow and you will really only need to top up the bottle maybe once a month or even less depending on the amount of kilometres you do on the scoot. Checking once a month should be sufficient. And here is the panel back on again. When replacing the panel, you want to get the screw in the same position it was when taking the panel off. You can view the slotted piece of metal and the slot in the plastic body panel. Make sure the metal piece is on the same angle as the plastic slot in the panel. You want to get the left rear of the panel in first and then simply push lightly on the handle again and it will pop back into place. Position the screw at the angle shown in the photo and you are done!! Congratulations. A shiny new blog to write up technical documents and how-to's based on my not so shiny RatRide. People can message or email me article requests. I will work out some way to include technical difficulty in the article title so people can read articles based on their own technical levels.